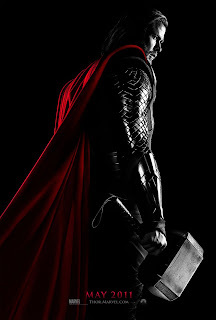 Marvel's Thor strikes theatres May 2011 - the same month as my birthday. While Thor accidentally hits ten days prior, that fact will just give me less hassles when I hold my party at my 3078th screening. Why the hassles? Apparently birthday cake candles are distracting to folks of the 'I love to complain variety' - go figure. Still, with that said, here's the official Thor trailer which shows why the god of thunder could just be one of THE comic films of all time, when the storm finally clears. AHHHHH!!!!!! I want this now. I don't think I can wait until next year. Me too Random, while I'll wait until the Cap trailer hits before being 100% certain, but I'm thinking Thor could be the biggest and most non-comic fan friendly film in their arsenal. I see this going down big time!